Developed to combine the Vespa style with a sporty mood and thrilling riding, the Vespa Sprint offers solutions that will more than match your expectations. 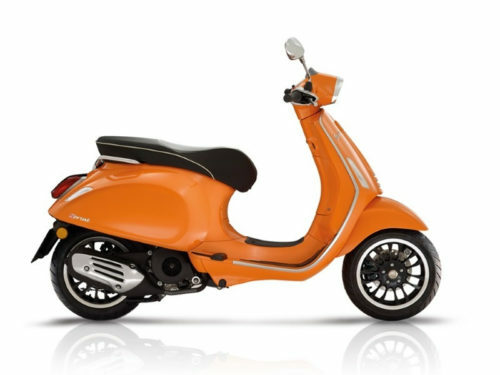 Call us today for the latest special offers available on Vespa Sprint Scooters. Vespa sales, service and repair. As its name suggests, this is the sportiest and most dynamic “small frame” Vespa in the whole range. Today’s Sprint builds on the heritage of the sporty Vespas of the ’60s and ’70s while retaining the features that made them so successful with the young of the time, such as the sporty saddle, the red rear shock and the rectangular front headlight. These traditional strengths have now been joined by the features and technology of a modern scooter, such as LED lights, analog-digital instruments, improved comfort,the added safety of front wheel ABS (for 150cc only), new front suspension, and 12” wheels mounted for the first time on a “small frame” Vespa. All this makes the Sprint the ideal Vespa for who anyone who wants to ride around town in style and on something dynamic.